The Second Circle by Patsy Rodenberg — Excellent thoughts on where effective communication comes from, and how to apply it real life situations. Cringeworthy by Melissa Dahl — A beautifully researched, personal, compassionate, and often hilarious look at the science of awkwardness, the stress response, social cues, and bravery. Full of useful information! Daring Greatly by Brene Brown — A transformational look at vulnerability: why we need it and how embracing imperfection and "failure" helps us to live the richest life possible. The Power of Habit by Charles Duhigg – Ever wonder why we do the things we do? The brain science behind habit, habit forming, and habit changing (because Mr. Duhigg informs us with great scientific authority that you can’t BREAK a habit–you can only change it to something better or replace it) is absolutely fascinating. Better Than Before by Gretchen Rubin - Another excellently researched book about habit formation. Ms. Rubin identifies four distinct ways we relate to habits and habit-forming: are you a rebel? A pleaser? Find out here! Now, Discover Your Strengths by Marcus Buckingham and Donald O. Clifton, Ph.D. – Ever thought “I’m not good at anything” or even “What I’m good at isn’t meaningful/important/cool?” These gentlemen are here to tell you that you ARE good at things, and that when you stop dwelling on your weaknesses, those specific strength areas have a lot to offer the world. We found the quiz scarily and exhilaratingly accurate. The Myth of the Nice Girl by Fran Hauser - In THE MYTH OF THE NICE GIRL, Fran Hauser deconstructs the negative perception of "niceness" that many women struggle with in the business world. How Women Rise by Sally Helgeson and Marshall Goldsmith - Goldsmith is known as the writer of What Got You There Won't Get You Here, but after some more experience with female clients and connecting with Helgeson (an expert on women leaders), he realized that the things getting in the way for women are slightly different. Here the two combine forces to identify the common habits they've observed in women that can hold us back - while staying firmly away from shaming of any kind. We dig it! Come As You Are by Emily Nagoski - a book about female+ sexuality with the funniest, frankest, and most useful explanation of the stress cycle we've ever read. Emily writes like your best girlfriend - I finished the book wanting to take her out for coffee. Below: Vox’s brilliant deconstruction of the stereotype about Asian people mixing up R’s and L’s - and a great look at how we develop our articulators within languages! From our friend and fellow voice coach Tom Burke: Whether you are recovering from a cold, suffering through allergy season or just need a great warmup to access your mix, you NEED to see this video. With a cup of water, and a straw - you will learn how to use the straw in voice and voiceless ways and exercise the proper amount of airflow needed, both in and out of the water. 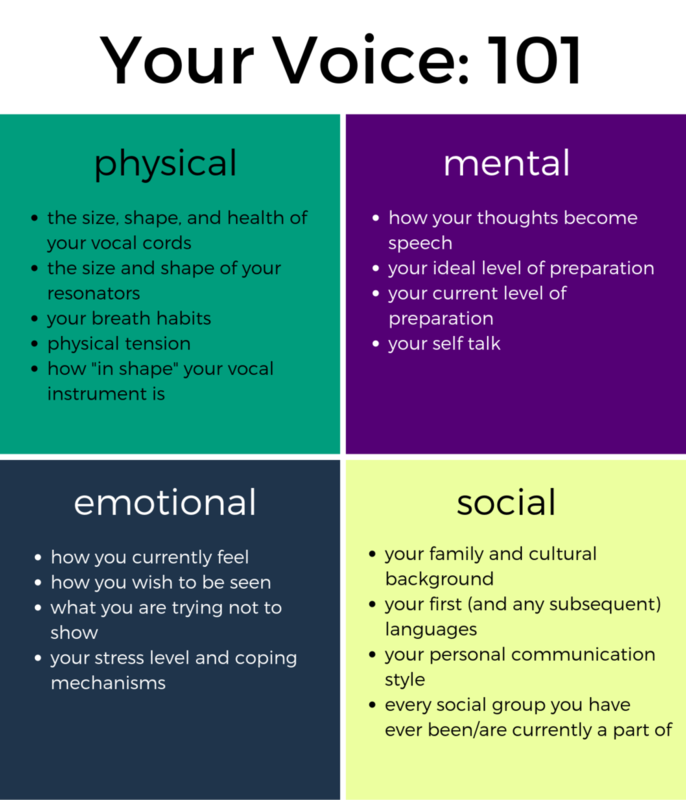 Below: Speech/Language Pathologist and Voice Pro Christine Estes gets “scoped” while speaking in full voice and in vocal fry - check out the difference!